First Look at Wesley Snipes on The Expendables 3 Set! 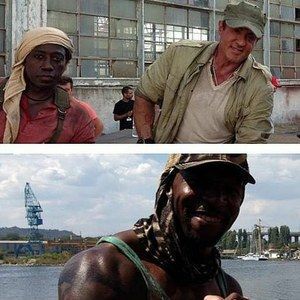 Franchise star Terry Crews, who has been around since the very beginning, has posted three behind the scenes photos from The Expendables 3, which just began shooting in Bulgaria. He compares his team to The Beatles, giving us our first look at Wesley Snipes, who appears to be playing a good guy this time out. Last time he faced star Sylvester Stallone it was as the villain of Demolition Man. Also seen on set are Jason Statham, Randy Couture and Sly himself. "EX3--Like the Beatles if they blew things up."